Some of my fondest videogame memories come from the time when I played long-defunct Papyrus Game Group’s Indy 500 and NASCAR Racing, or Geoff Crammond’s Grand Prix on my uncle’s old 386 desktop. At that time, I didn’t own a computer, so during visits to his house to see my younger cousins, I’d load up those games between the few rounds of Wolfenstein 3-D I could sneak in without any adults noticing. And when they did, I would be happily looping around the oh-so-charmingly low-poly rendered version of the Indianapolis Motor Speedway. But more often than not, they’d find me busily creating my own fun in NASCAR Racing. It was a very in-depth and detailed game for the time, allowing for a then absurd amount of customization. I absolutely loved to turn off all rule sliders and then race around any one of the oval tracks in reverse trying to see how many of my poor CPU opponents I could take out before my car would stop working as it came apart piece by piece, a blocky husk of its former self. I can’t even begin to count how many hours I spent enjoying playing NASCAR my way. I even went so far as to get into the modding scene that started to crop up a few years later, when I eventually got my own PC and had access to the Internet, where I found tutorials that taught me how to edit car liveries in order to update them to the current NASCAR season, or just plop any sort of pixelized prop I wanted to race around with. Make believe car destruction was something boys around my age at the time used to love doing, and outside of games it was especially so, at least for me and my matchbox cars. The Batmobile always won, for some reason, but that’s beyond the point of this review. The thing is, when I finally got around to play a game actually aimed at doing just that, crush everyone else’s ride and get out on top of the heap, I never got as enamored with them as I did with NASCAR Racing. Even the aptly named Destruction Derby by Psygnosis on the first PlayStation didn’t really keep my interest for too long, and Twisted Metal wasn’t really doing what I craved with all the silly weapons and vehicles. It was only when Bugbear’s FlatOut came out a decade or so later that my nostalgia for car carnage was rekindled. Not only did it look fantastic at the time, it took my idea of destruction fun to a whole other level, thanks to some impressive car modelling and how it all came apart during all the chaos that ensued during races. I was really excited with the notion of having a playground-like game experience when they announced Wreckfest years ago, and every so often I’d pop in that name on Google in order to see how the project was going. And it was only at last year’s E3 that I finally got to see the result of all their work as then the game was being displayed on an impressive three display racing wheel setup that was a lot of fun to drive in, even more so considering that the entire rig shook and bumped thanks to force feedback. 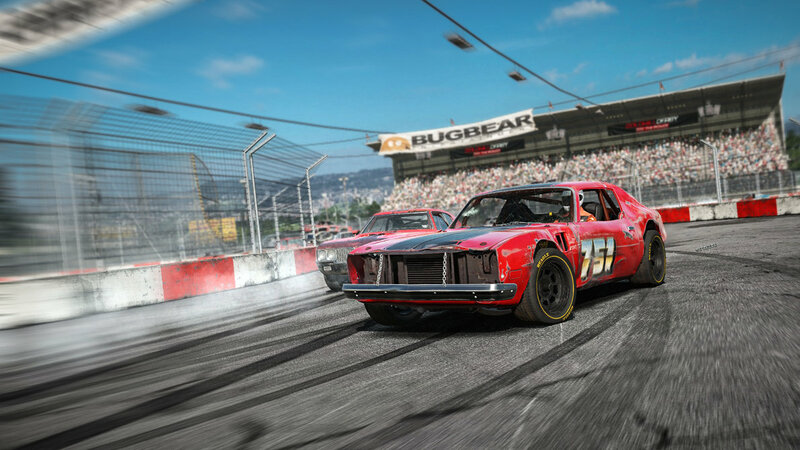 Wreckfest impressed the heck out of me then, and now that it’s finally out of early access, I’m finally able to play the darn thing and write about it without worrying about anything other than the sad automobiles on screen breaking. Wreckfest’s career mode plays surprisingly a lot like other more serious racing games. You get a list of events that you can partake depending on what car level you’re currently at, and you progress through them by acquiring points that you get by finishing races and demolition derbies. The further you upgrade a car, say, the stock one you start with, the higher its potential level, which is pretty much standard in racing games nowadays. The catch, though, is that you have to specialize some of your hogs depending on what kind of event you’re eyeing, because you might not be aiming to be the fastests all events in Wreckfest. Some have challenges that require you to survive longer, or my favorite of all, take out a certain number of opponents or cause X amount of damage. For a game all about causing ruckus and acting like a complete maniac on the track, there’s a surprisingly depth to Wreckfest. Starting with the difficulty settings that gets into the nitty gritty of customizing your driving, with some tweaks that end up really mattering in the grand scheme of things. Racing so recklessly takes a lot of finesse, who would’ve thought? I certainly wouldn’t, and if I knew having a decent set of shocks would not only stabilize my car in turns but also keep it from spinning all over during certain hits you take in a race, I would’ve saved my money at the outset, but alas, bad decisions are the curse of starting a game out fresh. That’s why it’s so fun to experiment around, and in that regard, after the starting sections of career mode Wreckfest is pretty open to trying things out due to how easy it is to gather funds even when not winning races per se, but merely for finishing challenges. Thanks to that, progression ends up going beyond merely leveling up, because even if you put yourself into a stale position of trying to find your style of play by upgrading a car accordingly, the game allows you to practice up and put your changes to use in events you may have already finished beforehand. Multiplayer is also really strong in Wreckfest, and a few weeks from release, it’s still going really well. I managed to get into quite a few races, and I’m happy to report that it runs great with little to no lag. The options in this mode are also quite generous, allowing for quite a bit of match customization. The best part is that the servers aren’t locked to any particular nodes, so there are plenty of options to jump in and play from the server navigator right away. While that might result in shady servers with crazy cheating like in many other games with open servers, I prefer to have this option rather than the locked out alternative of having to peer-to-peer connect which I usually have atrocious results with on PC. 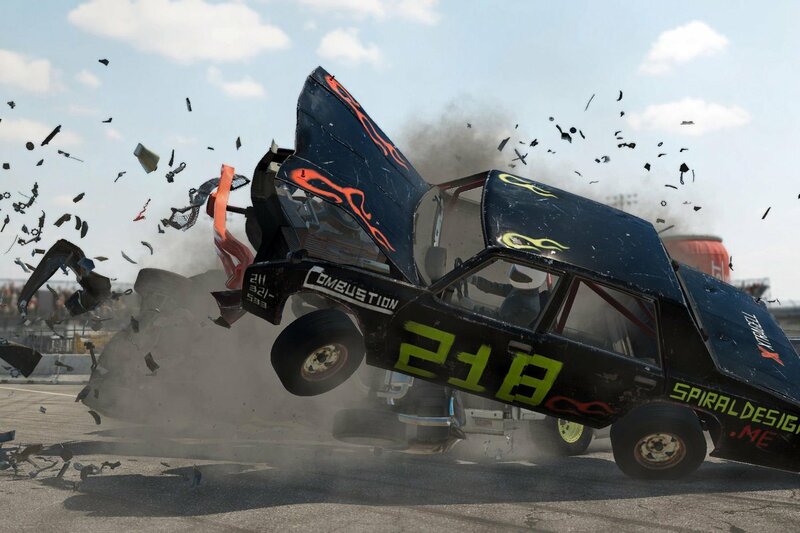 Visually, Wreckfest is an impressive show. Cars come apart beautifully, and what’s best, so do the tracks. Tires from barriers come apart and go flying everywhere, and the particles make each impact feel that much more crunchy. In longer races, expect to find car pieces lying around all over the track throughout the entire thing, and in destruction derby events, you might want to cover your nose because the smoke can get very dense. I was able to run Wreckfest quite stably with medium to high settings on my two year old PC, and in the end, I felt that this game came out of its long testing phase relatively well optimized. Unfortunately, I did run into a number of hard random crashes along the way that I was not able to replicate. Bugbear is incredibly good at injecting a lot of personality into their games, and even though it lacks the distinct level of crazy that made the FlatOut games so memorable, be it their soundtracks — I still wake up some days with “Baby With Two Heads” playing in my brain, go figure — or the zanny bonus games, but even still, Wreckfest has its share of personality. When playing in single player, you’re up against CPU-controlled characters with some incredible names that could very well pass for random people’s handles online. I’m not 100% sure how they pulled it off, but these tags are ridiculously random and hilarious. Frankly, I couldn’t be happier with how Wreckfest turned out. 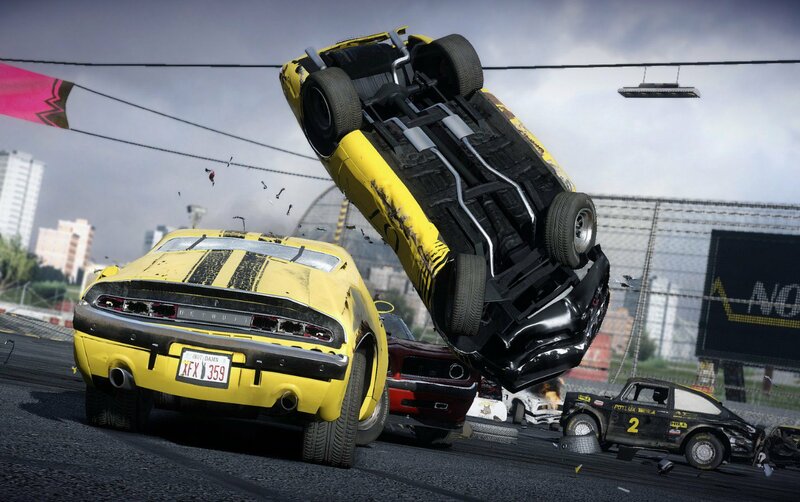 I have a specific type of destruction derby game that I’d love to be made in my head, one that could mimic the sort of chaos that I used to wreck as a kid in NASCAR Racing, and Wreckfest is the next best thing. It maintains a structure of play that brilliantly balances the crazy nature of destruction with more serious racing and progression. As with some of my other favorites this year, this will be among a handful of games I’ll repeatedly want to come back to.